Why Aren't You... Playing Couch Co-op? Competent character customisation and RPG elements within a Dragon Ball game. Dragon Ball games often carry a “been there done that” feeling with them. They’ve often rehashed the same story that everyone is used to, being the Freiza, Cell and Buu saga’s, and then maybe throwing in a movie or two for good measure. You know what to expect in regards to story, and that can definitely diminish the appeal of your new ‘Z’ game. This latest instalment, however, side steps this predicament by introducing time-travel, alterations to known stories and, of course, character customisation. Whether this new angle on the story entices you or seems far too predictable, watching Vegeta act as Ginyu in their cringe-worthy entrance animation is well worth the time alone. Character creation is very much the core of the game. Your character, whether it be Human, Saiyan, Majin and so on, will act as the primary character within your adventure, with each race having certain advantages and disadvantages. Decreased health but increased attack power benefits and Saiyan race, all whilst Humans are middle of the road within stat advantages/disadvantages, but they do recover Ki quickly. From your race choice, you’re able to determine your play style throughout your adventure, specifically whether you’ll start off with Ki based moves, physical, or a mixture of both. Regardless of what moves you start with, you can always go visit one of the many shops and NPC’s littered throughout Xenoverse’s clunky hub world. Yes, they’re still a thing. The hub world in all it’s…err…glory? 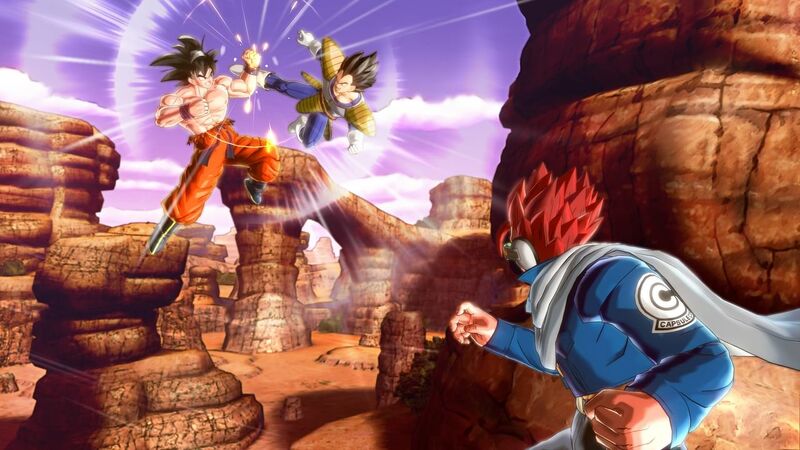 Throughout your time of Xenoverse, every single action outside of fighting will be done within the hub world. Whether it be skill shops, clothing shops that feature stat-boosting nostalgia armour for everyone (Radditz’s costume, for example), or bumping into Krillin for a sparring match so he can become your master (yes, I did choose Krillin over other people, obviously), this Hub World is the backbone of the game. Want to continue with story? Be my guest. Side missions to level up? Go on ahead. Unfortunately, multiplayer, both online and offline, are also located within this world, forgoing the more commonly used Multiplayer choice on the main menu. By forcing players down the path of selecting main menu, selecting your character, waiting for the unusually long load times, running to the relevant section of the hub world (split into three sections with, yes, loading in-between each), then talking to NPC’s to set a multiplayer match in, it looses the simplicity that all games ultimately need and deserve. As stated previously, this game borrows basic RPG elements to add a much needed depth to the formula. Whilst race impacts underlying statistics, you’ll level up and equip cosmetic items, such as armour, to otherwise effect the rest of your stats throughout your time as your custom character. Through battles, regardless of whether they are story or parallel (side) missions, will earn you experience points that you can allocate to character stats, such as Ki power, Physical power, etc. You’ll also earn money during the course of the game which you can spend on copious amounts of cosmetics and skills. Whilst I initially thought that this would be a tacked on feature, the need to grind to level up was much needed, especially so at the beginning of the game. Having to grind side missions so I was strong enough to able to beat Nappa and Vegeta in the same match made me question my worth as a gamer. After a few missions and the full aforementioned Radditz gear now attached to my characters Saiyan physique, I got my long overdue revenge… Only to later get my unmentionables handed to me against Recoome. Back to the hyperbolic time chamber to train up. The first few hours with the game can unfortunately be quite tedious, surprisingly mainly due to the custom character. Whilst it is obvious that they aren’t going to give you the coolest moves at the beginning of the game, the quality of attacks, both physical and Ki, are underwhelming, leaving you not only the desire to become stronger, but the question of how long you are able to sit through this. Yamcha is a god compared to you, despite being the heralded saviour that Shenron bought forth to save time. The stills in the game truly show how beautiful the game can be. Graphically, the game is a treat on the eyes. The simplicity of the graphics reflect the animation style that fans are accustomed to, whilst still offering the detail needed to stand out. I did often have brightness issues in the game, despite the settings being correct, where gameplay, both within battles and in the hub world, would be far darker than other games on the same system, and infant it’s own menu bar. The changes in brightness did detract from how immersed I was within the game, and I hope this will be rectified with a patch soon. Controlling the character itself can initially be difficult, having to learn the mechanics of fights, and putting all you’ve learnt into practice when there are multiple enemies and team mates on screen all at once only helps confuse the situation, but it eventually all becomes straightforward. Whilst I’d never say I was completely comfortable with this, I did learn the mechanics well enough to still have a good time and feel competent. Regardless of any criticisms I have of the game, however, it was just pure, simple, extravagant fun. Yes, long load times and an unnecessary hub world have somewhat soured the experience for me, but I spent so long focused on levelling my character up and unlocking more cosmetic items so I look the part truly kept me busy and entertained. And whilst I’ve made little mention of the character cast outside of the obvious, there’s something for new and old fans alike. This is fan service to the highest degree, a love letter to those who grew up with the series and still secretly wish they could throw their own Kamehama blasts on the odd occasion. Keep on trying, friends.